Heatfinders commercial gas engineers provide a range of commercial boiler services (over 70kw) We can offer commercial boiler repairs, servicing and maintenance, as well as complete commercial heating installations. We work within hotels, schools, churches, offices and industrial buildings covering all kinds of commercial and public facilities. Our commercial gas engineers are Gas Safe registered within the non-domestic area and dedicated to providing a professional, high quality service. We provide tailor-made commercial heating solutions from system design and installation through to ongoing maintenance, servicing and repairs. Whether its a single boiler heating system for a small B&B or a complete plant room for a large industrial unit, our Gas Safe registered engineers can help. As with all appliances, commercial boilers can go wrong. 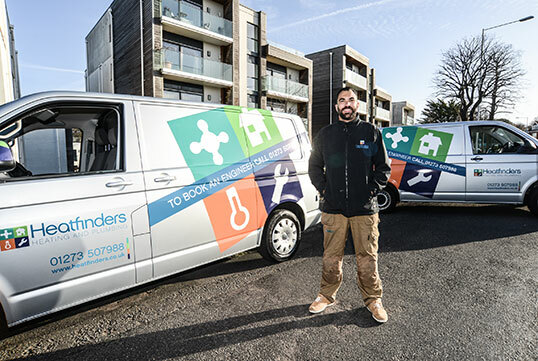 Heatfinders commercial engineers are on hand to respond quickly and efficiently to your boiler repair needs. Just like domestic boilers, commercial boilers require annual servicing to ensure efficient and effective operation. An unexpected breakdown can be a costly inconvenience, particularly in a commercial environment or school where this impacts on productivity or welfare.